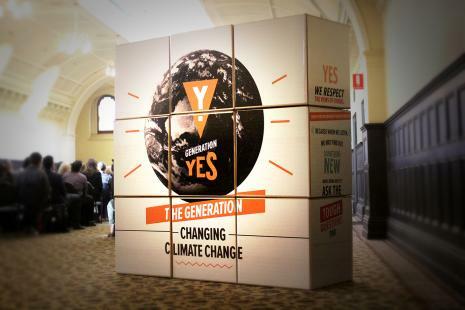 ClimateWorks Australia, in partnership with The Myer Foundation and Monash University, have recently partnered together to launch the ‘Generation Yes’ campaign across Australia. The ultimate objective of the campaign is for global carbon emissions reach net zero by 2050 and for all greenhouse gas emissions to reach net zero around 2070. The campaign is an effort to keep climate change below 2 degrees by sharing the stories of innovative Australians and local organisations, “helping them scale success and inspiring new awesomeness to happen.” Whether you are young or old, an individual or a business, the organisations behind the campaign believe the switch to a cleaner future is “already happening” and want to help accelerate this transition. The campaign offers four simple steps that can be followed in order to combat climate change and reduce carbon and greenhouse gas emissions. Step 1 is to reduce energy, step 2 is to produce cleaner energy, step 3 is to switch to cleaner fuels and step 4 is to sort out and store any remaining emissions. Changes and improvements can be made in buildings, in industries, in transport and in technology improvements. While embracing the challenge of ‘decarbonising’ Australia is seen as the environmentally responsible thing to do the campaign also points out that there are major benefits to doing so. Supporting innovative technologies, practices, services and business models can help them attract investment and result in the establishment of new jobs. Taking energy efficiency actions can help improve the productivity of the local and national economy while there are also other benefits in areas like health, productivity and amenity. Some of the risks of not doing transitioning to a low carbon economy are also pointed out. Economies that do not embrace change and remain relatively emissions-intensive are likely to be at a disadvantage and could face challenges related to regulatory constraints (both domestically and internationally), reduced exports and reduced investment. If actions are delayed, the campaign believes that they will still have to be taken at some point in the future, only with much sharper timeframes and less flexibility. Finally, Australia’s economy could be affected by the mitigation efforts of other more proactive countries, and could suffer as a result of reduced fossil fuel exports and the risk of stranded assets for fossil fuel based infrastructure. The good news is that many Australians are already taking action to combat climate change. One example of an initiative cited by the campaign is Australia’s first electric bus – the Royal Automobile Club of Western Australia (RAC) Intellibus – which was piloted in August 2016 in Perth. The bus is driverless, can transport up to 11 passengers and travels at an average speed of 25km per hour. By piloting this bus trial the Western Australian Government hopes that it will inspire other trials as well as further research and collaboration which will lead to an increased number of electric, driverless vehicles being used across Australia and the world. Another example is the installation of a new $47 million biogas plant by Bindaree Beef, one of Australia’s largest meat processors, in an effort to reduce wastage and transform organic waste into methane to create electricity. Methane released from livestock is 21 times more harmful for the environment than carbon dioxide and the production of meat for human consumption is a hugely energy intensive process. The biogas plant has resulted in Bindaree Beef reducing their power bills by 50% and slashing their carbon emissions by 75%. It also presents them with an opportunity generate increase revenues through the sale of organic waste thereby increasing their market competitiveness. Cities are also becoming involved and have an important role to play in reducing carbon emissions. The city of Adelaide is the first place in Australia – and one of the first in the world – where the South Australian State Government and the Adelaide City Council have signed parallel international agreements on climate change and emissions in addition to Australia being a signatory to the Paris Agreement. The City of Melbourne also has grand ambitions. In 2012 it achieved formal certification for the carbon neutrality of its operations, something that it has maintained every year since, but still wants to go further by reaching zero net emissions by the year 2020. Everyone has the ability to make changes in their living and working environments. Small changes taken by many can result in a large overall impact, encourage others to make their own changes and encourage governments and policy-makers to follow suit by setting ambitious carbon reduction targets and setting innovative policies to match.